Editor-at-Large Peter Bacon finds out about Israeli guitarist ELON TURGEMAN and his new album with drummer ADAM NUSSBAUM. Elon Turgeman, whose new album Climb Up is now released, will be a new name to many, so a little background is necessary. 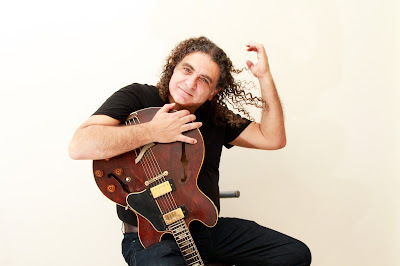 The guitarist was born in Jerusalem, Israel, in 1960, into a musical family which included a cantor father and a mother whose family had performed in the royal court of Morocco. Those Middle Eastern and North African roots together with listening to his older brothers playing and singing along to Elvis Presley, Ray Charles and Frank Sinatra, were early influences. Teenage years playing in his own rock band, studying classical music in high school, a stint in the Air Force band, a Berklee education and experience teaching contemporary music back in Israel have all fed into what Turgeman is today: a highly accomplished electric jazz guitarist and band leader. “A few months ago I made contact with the international drum icon Adam Nussbaum and decided to write original material for the recording and launching of a new album, Climb Up, with his participation. The entry point to this album for many outside Israel will clearly be the band’s special guest drummer. The Connecticut-born Adam Nussbaum – whom Turgeman first got in touch with through Facebook – brings a really distinctive kind of energy to every band he plays in, and his discography shows an impressive list of collaborations, including John Abercrombie, Michael Brecker, Gil Evans, Lee Konitz, Dave Liebman and John Scofield. Awareness of his musicianship has increased in the UK since his work with the transatlantic supergroup, The Impossible Gentlemen. And now, Elon Turgeman can add himself to that impressive roster. It Plays By Itself, the opening track of Climb Up, (video below) shows clearly the joyful, flowing drive that Adam Nussbaum brings to Turgeman’s group. Adrian, Oron and Rozen are all hugely respected players on the Israeli jazz scene. Both Avi Adrian and Yorai Oron – like Turgeman, a Berklee graduate – are faculty members of the Jerusalem Academy of Music and Dance and have been playing with Turgeman since they were teenagers. Elon Turgeman cites Pat Metheny, John Scofield and Mike Stern as influences and his current music reflects them, though his musical range on this album is broad, from the ballad Doron – a feature for Adrian – to the Methenyesque Gili, and jazz fusion romps like Blues For Niran and the title track. Recorded in a day in the studio in the classic jazz manner, Climb Up has the fresh immediacy that comes with such a method, but also the accomplished musicianship that means quite a lot is achievable in such a short space of time.